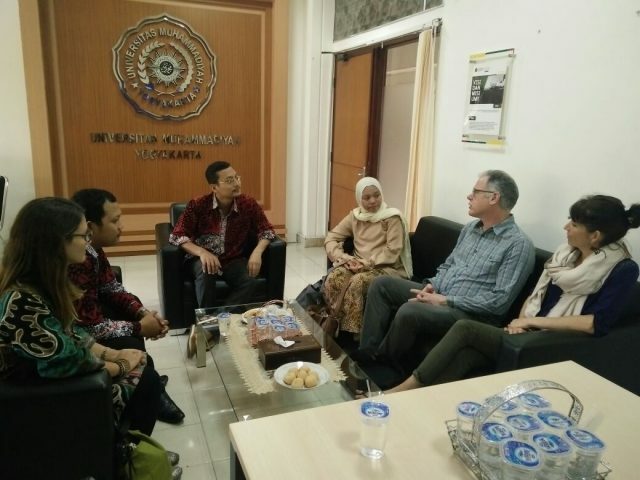 Yogyakarta, January 16, 2018, the representatives of Princeton University and Where There Be Dragons visited International Program of Government Affairs and Administration (IGOV), Universitas Muhammadiyah Yogyakarta (UMY). John Luria, a Director of Princeton Bridge Year Program was the representative of Princeton University and Dragons had Elizabeth Johnson, a Director of Gap and Bridge Year Program as the representative. Their visit welcomed by IGOV Secretary Rijal Ramdani, S.IP., MPA, as well as the head of Cooperation and International Affairs Eko Priyo Purnomo, M.Res., Ph.D. In term of discussion, both of the institutions were given a chance to deliver their thoughts accordance with the Student Mobility program that could be the improvement in the future. As well as sharing the ideas in term of Student Mobility program and strengthening the cooperation. IGOV itself has a relationship with Princeton University through the cooperation with the organization ‘Where There Be Dragons’, US, since 2015. The program that has been running so far is the Exchange Student from Princeton University to UMY. “I do appreciate what IGOV and UMY have been done for us so far. It was beyond of our expectation that the Students really enjoy the class and the program in general. Moreover, the Students were given a chance to exchange their cultures and languages through Bahasa and English Class.” Elizabeth Johnson, a Director of Gap and Bridge Year Program of Where There Be Dragons.